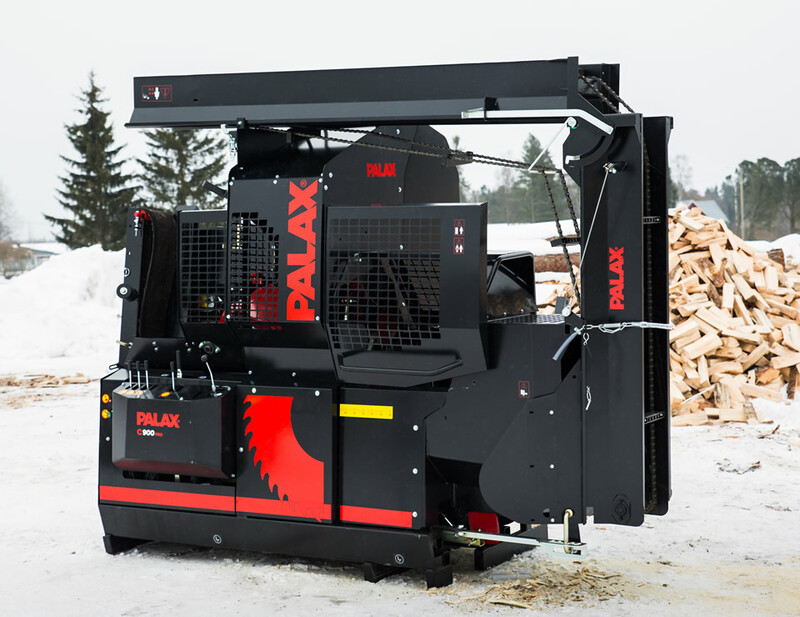 A robust firewood processor for contract work. In this redesigned powerhouse, the focus is on practicality, without forgetting the visual appearance. The elegance and comfort of use is improved by the control panel with height adjustment according to the operator's height. Processing firewood no longer places a strain on the body! 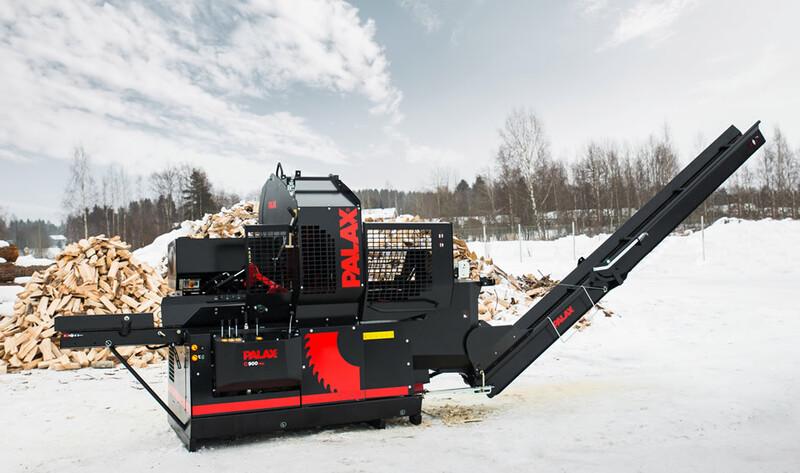 The Palax C900 is fitted with an unbeatably fast 900 mm hard-metal blade. In addition to the tireless blade, the splitting length of the machine is controlled by the patented Palax Optimi system. Together with the automatic high-speed valve, it makes the splitting operation unbeatably fast. The machine is equipped with a hydraulic log clamp and a discharge conveyor with adjustable speed. 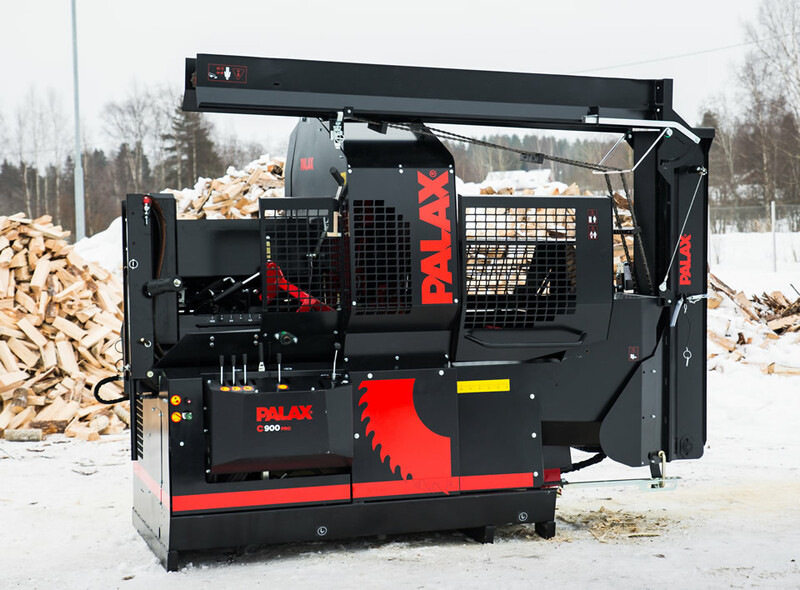 The machine also comes with quick-connectors for the Palax log deck. The all-hydraulic control, the sturdy in-feed conveyor together with the 4.3-m long discharge conveyor, make the processing of firewood effective and easy. The Palax C900 is the little brother of the Power100S. The processor has many of the same qualities and features as the big one. The C900 series has a 900 mm / 35.4" overhead hard-metal blade. Cut up to 37 cm / 14.6 " diameter wood. It has the patented Palax Optimi system and the automatic high-speed valve for splitting. 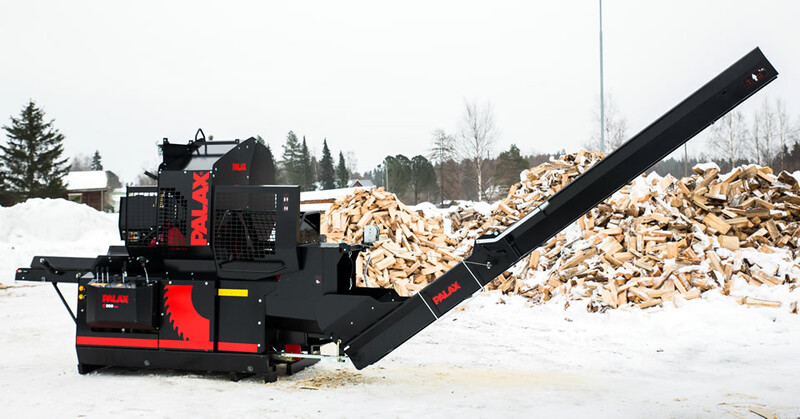 The fully hydraulic control, the in-feed conveyor and the 4.3 m / 14.1 ft long discharge conveyor makes firewood processing quick and easy. The C900 comes in two versions C900 Pro and C900 Pro+. The C900 Pro is equipped with a 8 ton / 17,600 lbs splitting cylinder. The C900 Pro+ is equipped with a 10 ton / 22,000 lbs splitting cylinder and it also has a powerspeed booster. Both models have a 2/4-way axe as standard and as an option a 2/6-way and a 2/8-way axe are available. Hydraulic oil ISO VGA 32 (VGA 46 for hot conditions): 80 l / 21.1 G? 350 mm x 4,300 mm / 13.8" x 169.3"
Length of log: 25 to 55 cm / 9.8 to 21.6"
Length: 2.85 m - 9.4 ft?? Width: 1.45 m - 4.75 ft?? Height: 2.45 m - 8.0 ft? ?